My wife and I are busy bees, following the death of her dad last week. We’re cleaning out his apartment, which is as much the contents of a life—for the meaning they represent. Following some chores at home, on Jan. 14, 2017, we walked down Cleveland Ave. to Van Buren to circle back on Campus to Bob’s place. 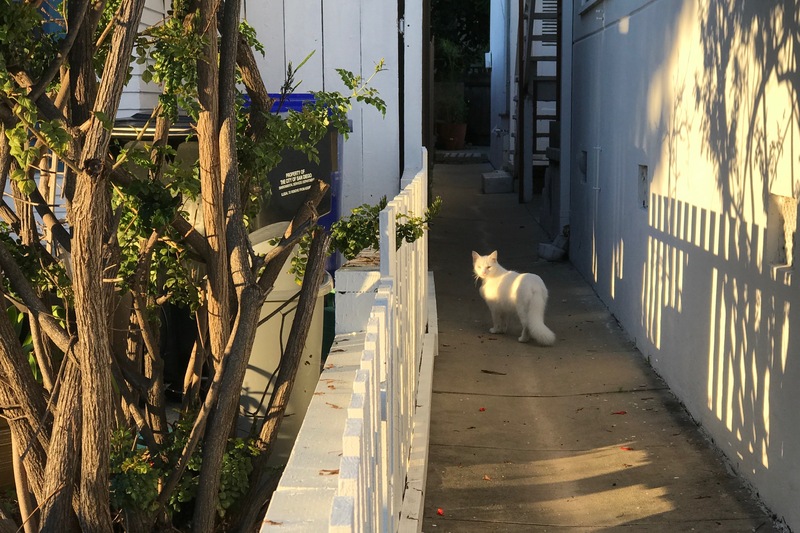 Ahead on the cross-street, white fur flashed running towards us before disappearing down an alley. Meet the frisky feline I nicknamed Shy. He rolled around like a kitty wanting attention but deliberately kept far away from getting it. 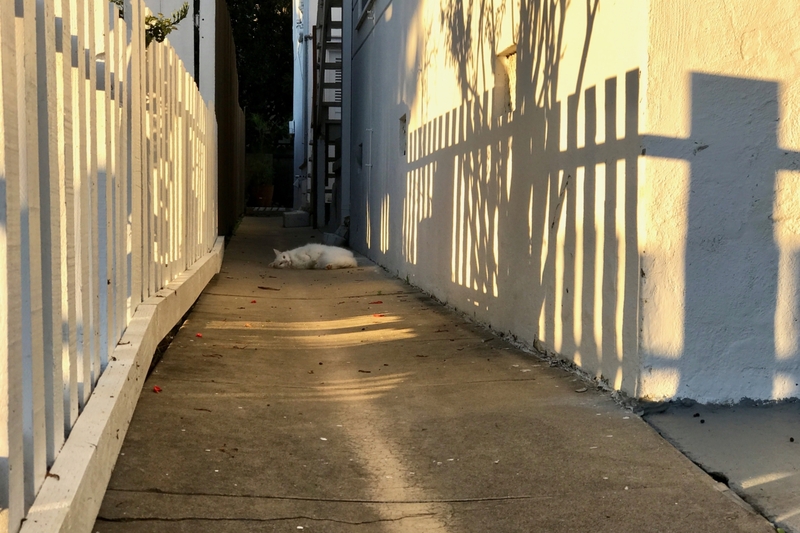 I shot the Featured Image, and its companion, at 4:35 p.m. PST, using iPhone 7 Plus second camera, to zoom. Both are straightened and tweaked. Vitals for the first: f/2.8, ISO 20, 1/235 sec, 6.6mm. The other is same except for shutter: 1/257 sec. Update, Oct. 5, 2017: My wife and I chatted with the owner of Watson and learned that Shy’s real name is Nimbus. Around the time of our meeting, he came to stay temporarily with the family along with an adult child and never left. The kitty mostly stays outside, but will come around for food and pats. He previously lived in an apartment for three years, and after experiencing the outdoors would tolerate captivity no more. Also in this series: Scruffy, Roly Poly, Woo, Skull, Biscuit, The Colonel, White, Chipper, Frisky, Stretch, Needy, Farfisa, Mates, Hunter, Pee-Pee, Blue, Blue Too, Bonded Pair, Patience, Fess, Jumper, Frenemy, Looker, Cozy, Scout, Lurks, Skit, Mini, Betty, Black and White, Stalker, Bell, Chill, Sammy, Scratch, Poser, Star, Grey and White, Watcher, Herman, Comet, Roman, Willow, and Chub.